Everyone seems to think that social media marketing is really easy but the infographic you will see below highlights the fact that this belief is completely incorrect. In reality, you want to be sure that you are going to know absolutely everything about what you do. Just as you would never build a car if you did not know how, you should not try to launch social media marketing campaigns without the necessary knowledge. If you do, it is a certainty that you would make huge mistakes. We have various mistakes that can be highlighted. However, the 8 that are presented below are definitely among the most common ones, starting from number 1: Having no social media strategy whatsoever. Remember that posting on social media sites and promoting anything with the use of the networks has to be done based on a strategy, just as with any other marketing type out there. We should clearly highlight the fact that mistake number 3 is among the most destructive and among the most common ones we see among beginners. You need to be sure that you will always focus on getting the right following for your business. This is something that is simply impossible when you buy fake followers. It is even impossible when you buy real followers but people that are not genuinely interested in what your presence is all about. 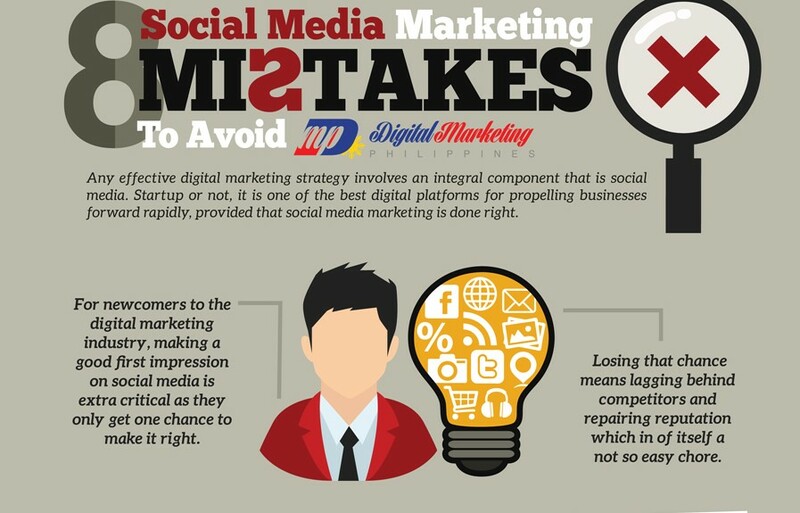 2 aspects from the 8 presented in the social media marketing mistakes infographic where highlighted above. We are sure that you already figured out its value. If you are interested in social media or you just want to see the mistakes that other make, you will want to read everything that is presented. At the same time, there are solutions that are offered. Allow yourself enough time to be sure that you are going to fully understand what is presented. If necessary, use the internet to learn more about the mistakes and what can be done in order to avoid them, which is something that a specialist always knows a lot about. Marketing is tough and social media marketing is no different.